New Moto Guzzi California 1400 unveiled! 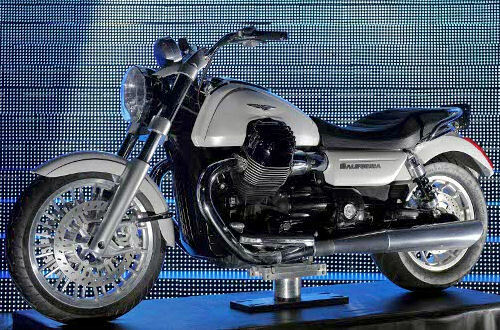 An all new Moto Guzzi California 1400 cc was unveiled by Piaggio Group at their international dealers meeting in Monte Carlo on January 27-28, 2011. Looking at the California 1400 photo closely, although it is grainy, it seems there may be a radiator mounted vertically in front of the engine, directly behind the front fender. 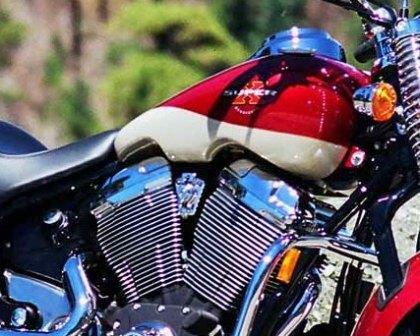 At the time of this article, some motorcycle magazines, including March 2011 issue of Motorcyclist, have already published that Moto Guzzi will introduce an all new liquid-cooled engine. As an owner of an ’07 Guzzi California Vintage, I can’t help but notice the extreme height of the valve covers on this new California 1400 prototype. Perhaps the extra height is needed for an overhead cam or dual overhead cams, but compared to the existing 1100 engine, or even the existing 1200, the new valve covers still seem to be extremely tall. The new fuel tank, with the cutouts to clear the engine, brings back images of yesteryear. 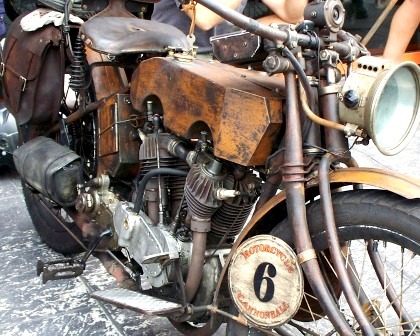 It was not uncommon for motorcycles to have such cutouts on the fuel tanks. One example is this 1915 Harley-Davidson 11J that participated in the 2010 Motorcycle Cannonball in the USA. Excelsior-Henderson is another example of cutouts in the tank to clear large cylinder heads. There have been lots others to have this feature, but the new Guzzi California tank style is much cleaner and tastefully done. This new California 1400 has a more stretched look, especially due to the elongated side covers replacing the more triangular shaped covers we are used to seeing. Not that it is bad, just different. Overall, it appears the Piaggio Group has fortunately left the Moto Guzzi California style mostly in tact. The modernized, longer look and larger engine size are a sign of the times. The Cali was overdue for a refresh, and from what we can see of it so far, it looks like a winner. Even so, I am glad to have one of the soon-to-be obsolete Californias with the 1064 cc air-cooled, pushrod type engine. Will I trade-in my Vintage in for the new 1400? At this point, the answer is no because I bought the California Vintage because it is highly reliable, time tested, and relatively simple from a mechanical perspective. The big question is whether this new Guzzi California 1400 will attract new Guzzi fans and get other motorcyclists to convert over to the brand? UPDATE: November 2012 EIMCA show was the official California 1400 launch to the public. 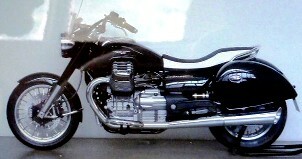 The Moto Guzzi California 1400 style remains mostly in tact. The modernized, longer look and larger engine size are a sign of the times. The Cali was overdue for a refresh, and from what we’ve seen so far, it looks like a winner. 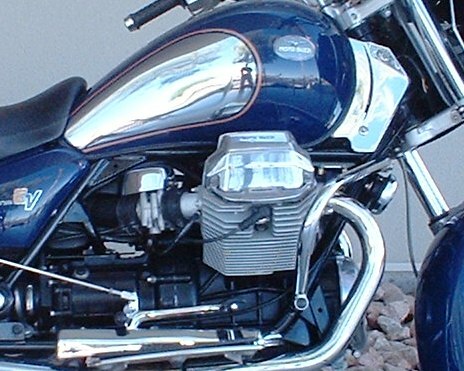 The hydraulic tappet Guzzi California 1100 recall remedy was to inspect the wear of the cam, and if found to be excessive, to inspect the oil sump and engine for metallic debris. Aside from replacing the cam and tappets, the engine itself would need to be overhauled if the metallic debris was found to have circulated through the engine. The often debated retro style tail light from the California Vintage now also comes on the Guzzi Black Eagle Edition California. I do get a variety of comments about the tail light on my Vintage. Unfortunately the new California was not persented on INTERMOT, the fair in Cologne. But i will go to EICMA, Milano to see the new one. I’m really glad to have my white California Vintage, as I just don’t care for the looks of this new 1400. I’ll probably take one for a test ride just out of curiosity, but I can safely say I won’t be buying one. I will definitly test ride one when they come out in the UK but dont like look of the bike at moment perhaps its will grow on me. Hi, guys. Looking forward to riding one. I’m 63 and have a 2001 Cali special sport aluminium with a touring setup and 58k on the clock. It’s a lovely bike. Bddumm!!! Bddumm !!!!! haha. Hi Rusty, mating two v7 motors together to make a v4 sure would be interesting, nice idea. As for the Ducati Diavel, I have to say that I hope Guzzi does not do that to the California, but maybe the Griso could be a candidate for that sort of design. I”m very disapointed, being located in the cradle of italian design, a region that has given us so many inovative beautiful machines, this rendering is the best piaggio can come up with. they should mate together 2 v7 motors,a water cooled v4, nicely styled pipes, killer borrani cast wheels, leather coverd hard bags, styled head lamp and a classy 2 tone paint scheme. Guzzi needs a Castiglione to breath some life back into this classic mark. just look at the Diavel. I am the proud owner of a customized 99 Bassa. Hi, not much to say about the 1400cc California yet, but I’m sure the Guzzi engineers would have built another great engine and drive train to get us around the world yet again. I do wonder about what weight it may be. My 1995, 1100i, California, with 117,749 km on it, has suited me fine with a nice amount of power and torque. I load up with my lady and tent, beds, mattress, small stove, lots of clothes and food, water, tools that I have never used (touch wood) going 120km/hr a fair amount of weight for a 58 year young man to go on 2 night rides. 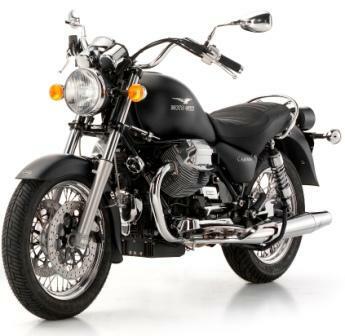 I do hope Guzzi still keep on making a bike similar to the vintage because I may be in the market for a new one soon. Thanks, MATT v.
The California 1400 looks superb. With a bike this size, and a, possibly watercooled, 1400cc engine to match, it should be a great long-distance tourer. Let’s hope Guzzi give us the option of some decent hard luggage.